Warren L. Jones III has spent more than 35 years as a professional bassist, composer, clinician and teacher. He has performed and recorded with national and local musicians and entertainers in the Valley of the Sun since 1980. 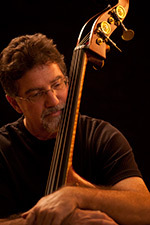 A Jazz Bass Performance graduate of the Arizona State University School of Music in 1986, he has taught in high schools, community colleges, and was an adjunct faculty member of the ASU and MCC Jazz departments. He appears with both local and national artists on more than 30 CDs and DVDs. Mr. Jones has composed over 40 pieces of music for various diverse ensembles. His compositions and arrangements have been performed locally and internationally. He was a founding member of the award winning Craig Render Quartet in the 1980's and has been mentioned in Downbeat magazine as a musician to be noticed in Arizona. He has performed as a sideman on many jazz recordings, including two releases by the Phoenix Jazz Quartet, several with the Keith Greko Trio, “Live at Inspirations” with Bob Kindred and Chuck Marohnic, "The Complete Phoenix Recordings" with the Carl Fontana/Conte Condoli Quintet, "A Cool Brassy Night at the North Pole" with Summit Brass, Fred Forney's "Into the Mist", and the critically acclaimed Bob Ravenscroft Trio's , “Live at Taliesen West”. Jones has been, and is a leader of several jazz ensembles, including the Trio 2000, the Quartetto del Sol, and co/founder of the Phoenix Jazz Quartet that featured Armand Boatman and the Moio Brothers. A recent group "BRIDGES" features Jacob Koller on piano and is a critical success. His Phoenix Jazz Quintet appeared at the 2012 Chandler Jazz Festival to rave reviews. Jones' new recording "I Imagine So..." features 11 original compositons and the valleys finest jazz musicians and improvisers.